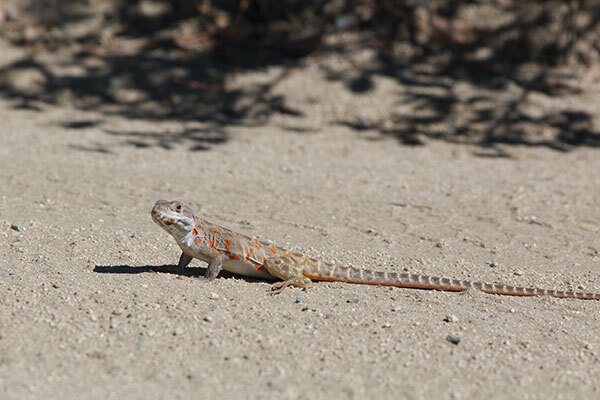 These lizards live mostly in Baja California, with just a teeny weeny little piece of range in southern California, much of it in view of the U.S./Mexico fence line. As I had been warned, these lizards are quite wary, and approaching them closely for photographs is a challenge. I was lucky to sneak up close enough to this adult female with her breeding-season orange splotches to get this photo. Matt Cage, Lorrie Smith, and I saw at least three of these lizards while working our way along the "road" from Mike's Sky Rancho to Rancho el Coyote (a.k.a. The Road From Hell). We'd see them from the vehicle as they raced from the sandy trail off into the bushes. We stopped a couple of times to hunt for them on foot, but they all evaded us.